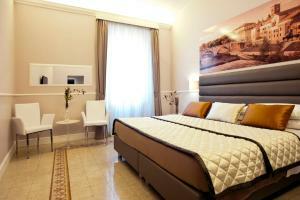 Featuring free Wi-Fi, Appartamento Coronari is located in Rome. It is 1 km from Saint Peter's Square and 2 km from Colosseum. Each air-conditioned apartment includes a flat-screen TV. The kitchenette is equipped with a stove, microwave and oven. The bathroom comes with a shower. Appartamento Coronari is 3 km from Circus Maximus and 5 km from Catacombe di Priscilla. Ciampino - G.B. Pastine International Airport is 16 km away. When would you like to stay at Appartamento Coronari ? Featuring free Wi-Fi, the spacious air-conditioned apartment includes a flat-screen TV. The kitchenette is equipped with a stove, microwave and oven. The bathroom comes with a shower. Please inform Appartamento Coronari in advance of your expected arrival time. You can use the Special Requests box when booking, or contact the property directly with the contact details provided in your confirmation. Guests are required to show a photo identification and credit card upon check-in. Please note that all Special Requests are subject to availability and additional charges may apply. A surcharge of EUR 25 applies for arrivals between 20:00 and 23:00, while a surcharge of EUR 45 applies for arrivals between 23:00 and 02:00. All requests for late arrival are subject to confirmation by the property. Each day we'll check prices and send you an email for your selected dates at Appartamento Coronari. If you don't have specific dates but would like to check prices for say next weekend or say next month we can check the price too. Click to write a review and share your experience of Appartamento Coronari with other travellers.